I was very impressed with this country, which has achieved twice as good result as Japan, competing with Japan during the Winter Olympics in Korea. 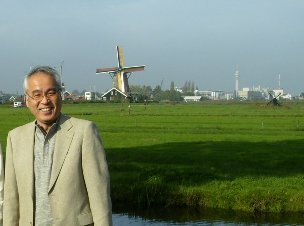 It is beautiful, rich in colors with wind mills and waterways, as shown in the attached picture of mine. Their population is about one fifth of that of Japan. As is known, it has been leading the world in the field of flower breeding and growing and I was working as an interpreter between Holland companies and a Japanese agricultural cooperation near our city of Onomichi.